All the information you need to get from Alaverdi to Haghpat and Sanahin by public transport. 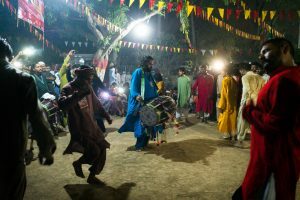 For more inspiration and information, check out our photo essay on Haghpat and Sanahin. Haghpat and Sanahin monasteries are among the most famous monasteries in Armenia. Both are UNESCO World Heritage Sites, and both are located in epic locations. For most tourists, the main approach to Haghpat and Sanahin is the town of Alaverdi. From here you can use public transport to visit both Haghpat and Sanahin. All of your travel for the day begins in Alaverdi’s central “station”… which is mostly just a gathering place for vehicles. The central “station” in Alaverdi (where the marshrutky are in the background). It’s hard to miss, as there’s only one main highway really, and there are plenty of taxis and marshrutky drivers skulking about. Sanahin monastery is a UNESCO World Heritage site. It was constructed in the 10th century. 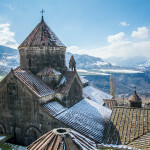 Sanahin monastery sits high up in the mountains overlooking Alaverdi. Those of great leg musculature and endurance could walk up the mountain road, but A) it’s super steep and B) hairpin turns mean you may be hit by a rogue car or marshrutka along the way. For the mere mortals, you can take bus 3 from Alaverdi station. It’s not a marshrutka, but rather an old (usually yellow) Soviet bus. The bus is 100 AMD for a one-way ride, and the ride is about 10 minutes long. The buses start running at 9:00 and stop running from Alaverdi station at 18:00, so make sure you give yourself enough time if you’re visiting in the afternoon! We’re still amazed that this bus (barely) managed to drive up the mountain. Ride it all the way up the mountain, where it will stop in a central-ish square near a bunch of other buses of the same color. From there, you have to walk to the monastery. It’s a 15-minute walk, without much sign action aside from a sign in the central square. Luckily, the monastery is visible for much of the walk, so just head up the mountain until you see some souvenir shacks. Going to Armenia? Don’t miss our report on how much it costs to go backpacking in Armenia. Haghpat monastery is another UNESCO site that’s a wee bit newer than Sanahin, but also founded around the 10th century. Haghpat is a short drive away from Alaverdi. The monastery is situated atop yet another hill. Marshrutky run from Alaverdi station at 8:15, 9:00, 10:30, 11:30, 13:30, 14:30, 16:30, and 17:30. It’s 200 AMD for a one-way trip, and the ride is 20 minutes long. Look for the white marshrutka with the Haghpat sign. Marshrutky back from Haghpat run half an hour later from the aforementioned times (they wait at the monastery for 10 minutes). The last marshrutka from Haghpat runs at 17:00, so don’t miss it! If you’re going to visit Haghpat and Sanahin, the most logical place to base yourself is Alaverdi. There are several places to stay in this small town, but by far the best is Iris Guesthouse. This homestay is run by a lovely family with boatloads of knowledge. Iris has become so successful that there are several copycats in the area trying to imitate her. Make sure to check the photos so that you stay at the right place. You can book Iris Guesthouse here. Have you recently headed to Haghpat and Sanahin by public transport? Let us know how you got there in the comments–it’s good for other travelers to see the most-up-to-date information! American by birth, British by passport, Filipina by appearance. Addicted to ice cream. Enjoys climbing trees, dislikes falling out. Has great fondness for goats which is usually not reciprocated. Great post – thanks very much! Happy to report that all info is still correct one year later :). The only thing that caught us out was you need to catch bus #3 heading towards Vanadzor from the centre. From Haghpat we hitched to Akhtala which has an amazing church full of frescoes. Happy travels! Hi Alex, thank you for this attractive article! Seems like you explored my homeland!